RETURN THE LOVE... SEND FLOWERS! 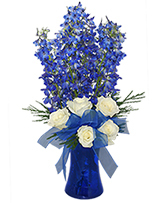 To Send a Fresh Flower Arrangement in the Stamford, TX area, Call STAMFORD FLORAL Direct or Order Flowers Online 24/7. Show how much you love and appreciate them with this colorful gift of flowers. It's sure to brighten the day, as well as their home or office. Call STAMFORD FLORAL or order flowers now for someone who means the world to you! Best Sellers update weekly with the favorite arrangements of the people of Stamford. If you want to send flowers to a friend, these trendy blooms are a great place to start. Let STAMFORD FLORAL create any of these best sellers for your home or party.